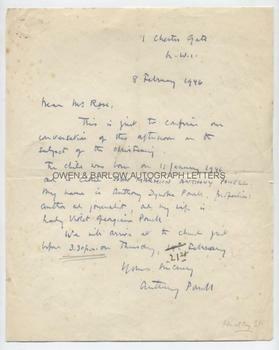 ANTHONY POWELL Autograph Letter Signed. Anthony Dymoke Powell. English novelist. Author of the 'Dance to the Music of Time' series. ALS. 1p. 1 Chester Gate, NW1. 8th February 1946. To Mr Rose. "This is just to confirm our conversation of this afternoon on the subject of the Christening. The child was born on 11th January 1946 and is called JOHN MARMION ANTHONY POWELL. My name is Anthony Dymoke Powell, professional author and journalist, and my wife is Lady Violet Georgiana Powell. We will arrive at the Church just before 3.30 on Thursday 21st February. Yours sincerely, Anthony Powell." 4to. 26 x 20 cms (10 x 8 inches). Slight creases. Very light mounting traces at top edge of verso. Fine. 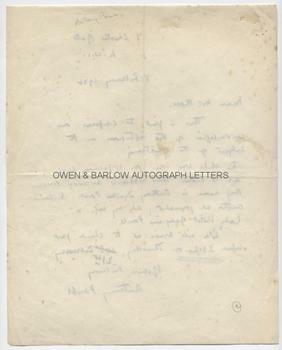 An early Anthony Powell letter. His first novel 'Afternoon Men' had been published in 1931. His novel 'What's Become of Waring' (1938) struggled to find a publisher and, when it did, had sold less than 1,000 copies. Powell had all but abandoned creative writing during the war years. He rejoined his regiment, the Welch Regiment, before transferring to military intelligence in Whitehall. In his spare time he worked on material for a biography of John Aubrey, which was published in 1948. After the war he returned to the contemplation of novel writing and for the next 30 years worked on his magnum opus, 'A Dance to the Music of Time', the first volume of which, 'A Question of Upbringing' was published in 1951. Anthony Powell had married Lady Violet Packenham in 1934. John Powell was their second son.